The school serves more than 600 elementary students, which includes almost 100 children from the Buena Vista Migrant Camp for part of every school year. Some parents have told the principal that their children are already talking about going to college after some students visited UC Santa Cruz. Flora Lu couldn't wait to see the newly tilled soil next to Watsonville's Calabasas Elementary School. Rain the day before had turned the dirt to sticky mud on the bottoms of her shoes, but what she cared about was the wide-open field - and its seeds for the future. Lu, provost for Colleges Nine and Ten and professor in Environmental Studies, may be best known for her longitudinal research with Native Amazonians of Northeastern Ecuador. But the professor's feet are also firmly planted in the Pajaro Valley, where so many of the people who work in this bountiful agricultural area can't afford to buy the food they harvest and don't have access to land to grow it for themselves. 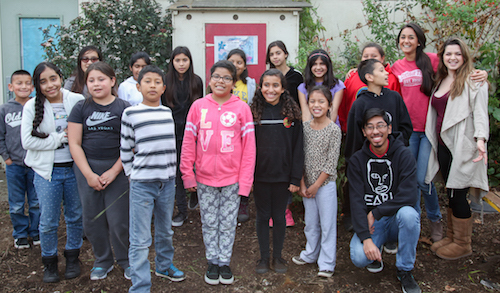 Three years ago, she established a community partnership with this school in south Santa Cruz County, where a few years prior some UCSC interns had started a Children's Discovery Garden that fell into into neglect when the students graduated. Lu's students in her service-learning course on environmental justice renovated a greenhouse that had been vandalized, repaired compost bins, installed an irrigation system, built raised vegetable beds, and revitalized the afterschool garden program for the children of Calabasas School, many from farmworker families. Lu has even bigger dreams going into 2016 with funding support from the UC Santa Cruz Blum Center on Poverty, Social Enterprise & Participatory Governance, as well as Measure 43, the Student Fee Advisory Committee, and local donations of time, money, and materials from such companies as Whiskey Hill Farm, Granite Construction, and Eco-Shift Consulting. "This program will forge campus-community collaborations between UCSC students and a low-income, people-of-color community in Watsonville," she said, "with the goals of cultivating food security and sovereignty, and strengthening parent-school connections." 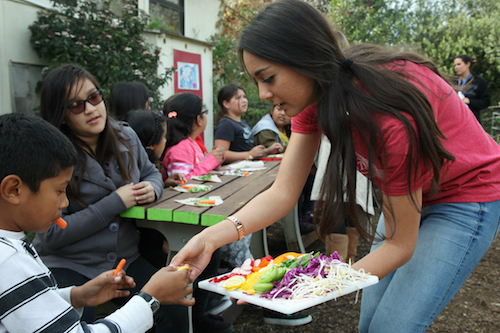 Expanding the afterschool program and integrating the cultivation of food into the educational curriculum of both the elementary school and UCSC. Creating a vibrant community garden with the help of parents and community members that will serve as a catalyst for greater neighborhood cohesion and parent involvement. Fostering culturally important plants, improving food security, and building eco-friendly infrastructure at the community garden, including a solar-powered outdoor kitchen and a rainwater harvest system. Establishing a sister garden at Colleges Nine and Ten to exchange agroecological knowledge between UCSC and Watsonville, and organizing a campus event for Watsonville residents to share their experiences as immigrants, farmworkers, and advocates for food justice. Providing experiential learning opportunities for UCSC students, and expanding and enhancing curriculum about food justice. The experience of collaborating with UCSC has already been life-changing for students, said Todd Westfall, principal at Calabasas, who grew up in the Watsonville neighborhood in the '70s. The school serves more than 600 elementary students, which includes almost 100 children from the Buena Vista Migrant Camp for part of every school year. "We took two busloads of parents and students to Colleges Nine and Ten at the UCSC campus on 'Hallows' Eve,' and they welcomed us with dinner, presentations, games, and activities," Westfall said. "They even took the students trick-or-treating through the dorms. It was beyond our expectations. Most of these parents had never graduated from high school, and now their children are talking about college." The Hallows' Eve program was the joint efforts of multiple units across Colleges Nine and Ten, including the Dining Hall, the CoCurricular Programs Office, Activities, Residential Life, and Service-Learning. Families from Beach Flats and UCSC Family/Student Housing were also invited. Lu said that such programs also benefit UCSC students, especially first-generation college students who may feel disconnected on campus. "We truly believe that our campus/community efforts foster retention among our students," Lu said, "and it sends a message of what is important."